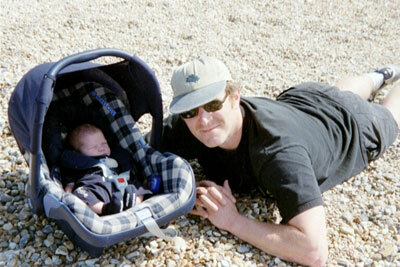 On the cheeringly palindromic date of 30/6/03, at approximately twenty-five past midnight, Lou gave birth to our son. He arrived a week late and not without some bother, but he weighed in at a very respectable eight and a half pounds and was and is in every respect healthy. Now eight weeks old, so far Monty has turned out to be happy and talkative, if not exactly an aid to sleep. Here’s a picture of him, less than a week old, along with his dad, hard at work. After this, I promise: not much talk about babies on this website. Nothing worse than dads rabbiting on endlessly about their infant offspring.